Could shark tourism help save wild sharks? As shark-watching and diving operations have grown increasingly popular, so too has the revenue generated by the shark tourism industry (now in the hundreds of millions of dollars, according to researchers from the University of British Columbia in Canada). The result is that sharks are worth far more alive than dead, and countries are realizing that they stand to benefit by protecting their shark populations. To explore how shark tourism is changing local shark fishing communities, Fusion’s environmental correspondent Nicolas Ibargüen traveled to a small fishing town in Baja, Mexico. In Puerto San Carlos, an NGO called Pelagic Life is working to convert convert local fishermen from shark hunters to shark conservationists. By creating alternative job opportunities for the 70 families that rely on shark fishing for their livelihood, Pelagic Life hopes to both uplift the local economy and give sharks some much needed space. They can actually earn a much better living through ecotourism than what they are currently going through with shark fishing. “The shark fishing community here is quite large and we wanted to turn them to the other side and let them know… that they can actually earn a much better living through ecotourism than what they are currently going through with shark fishing,” explained Pierre Vignal, a former project manager for Pelagic Life. “The current tourist operators generate roughly nine million USD per year, and the community generated two million dollars a year through fishing… so, you have a 400% increase through tourism.” Since starting the project, Pelagic Life has recruited nine former fishermen families to work on shark tourism. Still, with an estimated 200 sharks taken per day during the fishing season, Pelagic Life has a lot of work to do. The fishing takes place at night and it is very dangerous…you have to go because there is nothing else to do. Pelagic Life isn’t the only conservation organization trying to convert shark fishermen into shark conservationists. 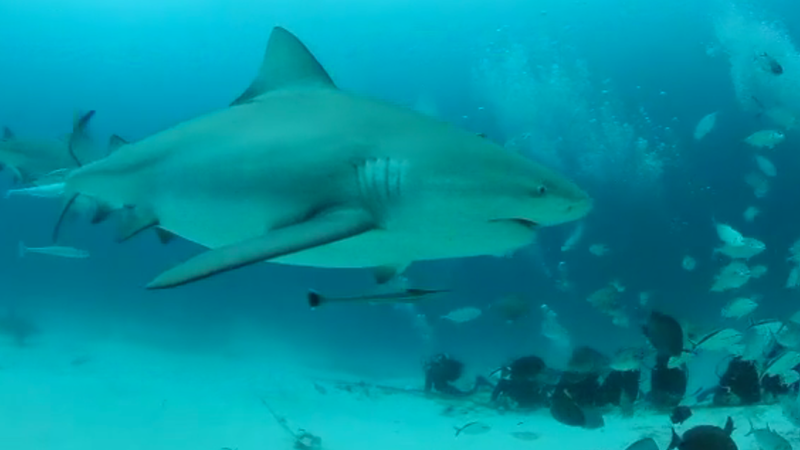 In Playa del Carmen, on the other side of Mexico, local operators have capitalized on the presence of bull sharks to create a booming industry. Shark diving is now bringing in millions of dollars per year in tourism and related activities, and helping hundreds of local families, including former shark fishermen, to make a living. The reality is that across the globe, millions of people have relied for generations on fishing. But now, because of global overfishing, they’re forced to work harder and travel farther from shore in order to fill their hooks and nets. At the same time, over 100 million sharks are killed by humans every year. While more nations are realizing the economic benefit of protecting their local shark populations, global action is needed to stop the culling of these apex predators and protect local economies. “Sharks see no boundaries, and will continue to be targeted unless the entire world embarks on this journey together,” explained Ibargüen.